I’ve found it. The quintessential marriage of pasta and sauce. 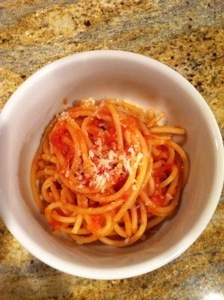 The pure, simple, perfect combination of tomatoes and pasta without one single unnecessary addition or adornment. First, a little background: My husband is a runner. Every Saturday morning he has a group training run and this Saturday’s was a 20 miler. Because he runs every Saturday, every Friday night is pasta night here. Being the good, supportive wife that I am, I happily partake in what I refer to as “sympathy carbo-loading”. So, in preparation of a 20-mile run, I asked what kind of pasta he wanted. His response was “something simple with a tomato sauce”. You asked for it…You got it! I have had this recipe for ages, yet for some unknown reason had never made it until Friday. But rest assured, it will move into heavy rotation in this house. The recipe comes from Bon Appetit and it is, quite simply, pure, pasta perfection. Heat oil in a 12″ skillet over medium-low heat. Add onion and cook, stirring, until soft, about 12 minutes. Add garlic and cook, stirring for 4 minutes. Add crushed red pepper flakes and cook for one more minute. Increase heat to medium, add tomatoes and season lightly with kosher salt. Cook, stirring occasionally until sauce thickens slightly, about 20 minutes. Remove pan from heat, stir in basil and set aside. Meanwhile, bring 3 quarts water to a boil in a 5-quart pot. Season generously with salt. Add pasta and cook, stirring occasionally until about 2 minutes before tender. Drain pasta reserving 1/2 cup pasta cooking water. Discard basil and heat skillet over high heat. Stir in reserved pasta water to loosen sauce; bring to boil. Add pasta and cook, stirring, until sauce coats pasta and pasta is al dente, about 2 minutes. Remove pan from heat; add butter and Parmesan cheese. Let me say this straight out: I am not a fan of insanely spicy food. I have always held firm to the belief that food (specifically the act of eating food) should not hurt. I love spice, and a bit of heat is always fine, but fiery, blow-the-top-of-your-head-off food is not my style. Usually. 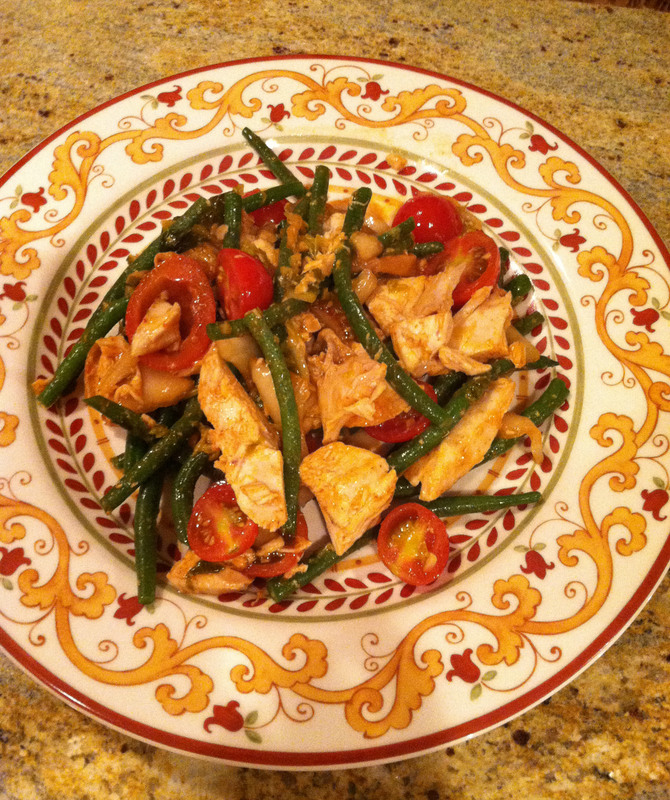 This past week I made Korean-Style Chicken and Green Bean Salad for dinner. Now, I know kimchi can be spicy. But I thought that the small amount of the sauce used compared to the vast amount of chicken, beans and tomatoes would temper the heat. Yeah, well… not so much. Now don’t misunderstand me, this dish was not incendiary. But it was very spicy. Spicier than I usually can tolerate. However I found myself going back for just one more bite. OK, maybe one more. Dang it’s hot… but it’s so good. Just one final bite. Whew! My husband went back for seconds. Then again, he was born in Albuquerque where chili pepper runs in the bloodstream. And while I didn’t exactly clean my plate, I ate more than I thought I would after my first couple of bites. And I learned that heat can come with amazing flavor… and yes, some pain. But then again, we often suffer for that which we love, right? The recipe comes from Sunset Magazine. You’ll notice I’ve edited it to replace parsley with cilantro. I just really hate cilantro and will not apologize for it. If you like it, then by all means, knock yourself out. Blanch beans: Drop into a pot of heavily salted boiling water (it should taste like seawater). Cook until tender-crisp and bright green, 2 to 3 minutes, then drain and drop into ice water until cool. Drain and set aside. Meanwhile, in a small bowl, whisk together oil, kimchi juice, salt, chili paste, and vinegar to taste. Drain beans, pat dry, and put in a large bowl along with chopped kimchi, chicken, tomatoes, and cilantro parsley. Gently toss with enough dressing to coat. Serve any remaining dressing on the side. This week’s Weekly Winner might qualify as the strangest prep ever for pork chops. I’ve brined them, dry rubbed them, marinated them, breaded them…. you name it. But until this past week I have never made what was basically homemade ranch dressing, impaled the pork chops with a fork, and soaked them in the dressing prior to broiling. Never. But trust me, I will do it again! In all honesty, it was the Corn-Bacon Slaw that got my attention in this recipe. I saw the picture of the nice golden brown and delicious pork chops and thought that the slaw would be a great accompaniment. But the two components are joined together with the fabulous dressing. The recipe comes from Food Network Magazine and is quick and easy. It is also yet another excuse to visit my boys at the Paulina Meat Market for more of their fabulous pork chops and house-smoked bacon. Preheat the broiler. Whisk the buttermilk, mayonnaise, parsley, vinegar, garlic, sugar, 1/4 teaspoon salt, and pepper to taste in a medium bowl. Prick the pork chops all over with a fork. Set on a rimmed baking sheet, season with salt and pepper and drizzle with half of the buttermilk dressing, turning to coat. Let marinate 15 minutes at room temperature. Transfer the baking sheet to the broiler and broil until the pork is browned, 4 to 5 minutes per side. Meanwhile, cook the bacon in a skillet over medium heat until crisp, 4 to 5 minutes per side. Remove to paper towels and let cool slightly; roughly chop. Add the corn to the drippings in the skillet and cook, stirring, until browned, about 3 minutes. Combine the bacon, corn, coleslaw mix, tomatoes, 1/4 teaspoon salt, and pepper to taste in a large bowl. Toss with the remaining buttermilk dressing. 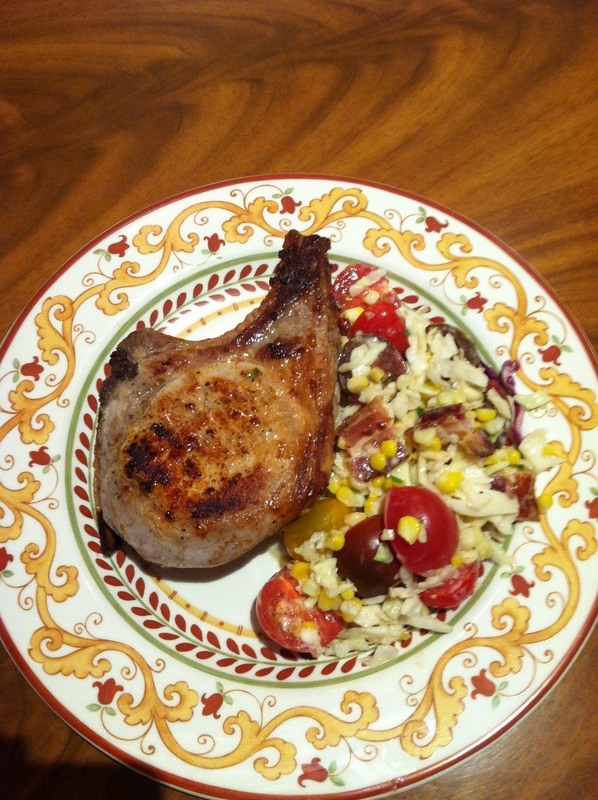 Brush the pork chops with any juices from the baking sheet; serve with the slaw. The weather here in Chicago is schizophrenic this time of year. Mostly it continues to be summer… hot and humid. But every fourth or fifth day you get a glorious day that is clear, dry, breezy and in the low 70s. Cool enough to turn off the air conditioning and open up. On those days it even smells like fall outside. Then the heat returns and once again the windows get closed and the air cranks back up. So it is still salads that I turn to most often for lunch. But with the occasional glimpses of things to come weather-wise I am starting to crave autumnal foods. Soups, stews, root vegetables…. it’s just still too dang warm outside for that. To bridge that gap I turn to a recipe I’ve had for years and which I dub this week’s winner : Spinach, Bacon and Sweet Potato Salad. I adore this salad because, while it is still a salad at heart it is a bit warm (not hot) and has the feel of a heartier dish. And, it has bacon in it!! Yay, bacon! The recipe, oddly enough, comes from Runner’s World Magazine. Don’t get the wrong idea here. I’m not the runner in the family, hubby is. But he has pulled some great healthy recipes from the magazine over the years and this one is no exception. Preheat the oven to 400°F. Put potatoes on a baking sheet, drizzle with two tablespoons of the oil, sprinkle with salt and pepper; toss to coat. Roast, turning occasionally, until crisp and brown outside and tender inside, about 30 minutes. Remove and keep on the pan until ready to use. While potatoes cook, put bacon in a stainless steel or other nonreactive skillet and turn heat to medium. Cook, turning once or twice, until crisp. Drain on paper towels and pour off fat, leaving darkened bits in the pan. Put back on medium heat; add remaining oil to the pan. When hot, add bell pepper, onion, and ginger to the pan. Cook, stirring once or twice until just softened, about five minutes; stir in cumin and bacon (broken into pieces). Stir in orange juice and turn off heat. (The recipe can be made up to an hour or so ahead to this point. Gently warm dressing again before proceeding.) 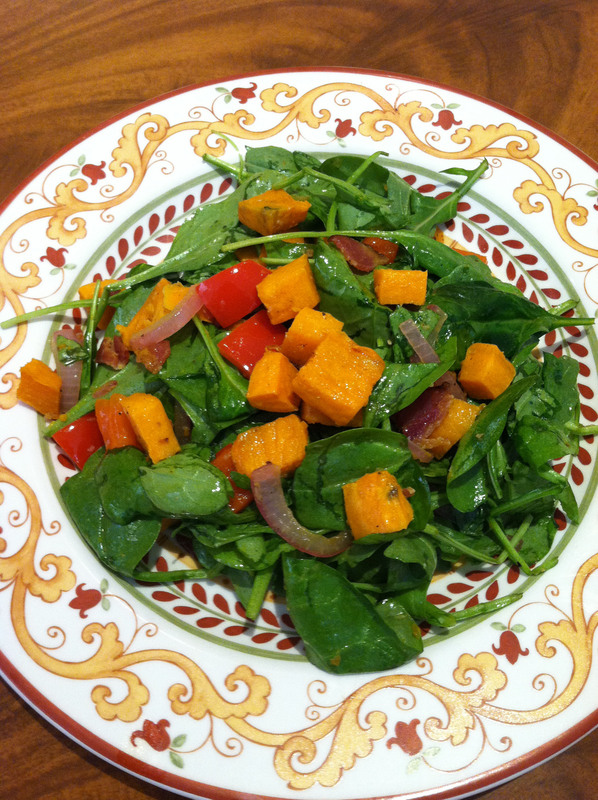 Put spinach in a bowl large enough to comfortably toss the salad. Add the potatoes and warm dressing. Toss to combine.